Businesses are responding to a call to help with elections, but not everyone is pleased. Steve Nemeth still isn’t sure why he is so pissed off. He intended on the day of the primary election to go for a quick vote, then go about his business of caring for his young son. Instead, he spent the afternoon in silent protest outside the poll location. Two of the poll workers at Nemeth’s polling place, the Sweet Library in the Avenues, were employees of Utah’s low-level nuclear waste company EnergySolutions, wearing matching white shirts with an EnergySolutions logo. Nemeth telephoned City Hall, his City Council representative, and the office of the Salt Lake County Clerk, which runs elections. Finally, he decided, “If it’s OK for these folks to wear their shirts with the logo,” he’d make his own. He spent two hours outside the library with a homemade T-shirt warning voters of the “undemocratic” “conflict of interest” inside. 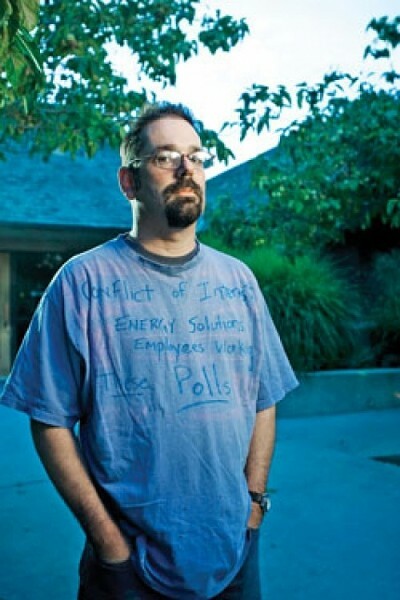 It’s not as if EnergySolutions had a candidate in the primary election. It’s just that the waste-disposal company gives Nemeth bad vibes. He tries to describe his disquiet to abstinent neighbors by asking them to imagine poll workers wearing shirts advertising a beer brand. When Nemeth called the county clerk’s office, he says he was informed the county’s list of volunteers doesn’t show employers, and that poll workers are free to wear whatever they want. There is a bit more to it. Earlier this year, Salt Lake County Clerk Sherrie Swensen sent letters to businesses and nonprofit organizations asking that employees be given the day off to work at the polls. In exchange, participating organizations could become the “official sponsor” of a polling place. The recruitment drive—called Partners in Democracy—is an attempt to solve the problems of declining ranks of volunteer poll workers in the face of increasingly technical computerized voting. Salt Lake County got the idea from a county in Kansas where Sprint supplied some poll workers. For September’s primary election, three groups became official sponsors of Salt Lake County polling places: Manpower Temporary Services, the Applied Technology College and the Hinckley Institute of Politics at the University of Utah, where students touted the Partners in Democracy concept to fellow students. By recruiting six poll workers—enough to completely staff a polling place—the groups earned official sponsor status and the poll locations where they worked were outfitted with three small “This polling location is sponsored by …” signs. EnergySolutions, with three employees at the polls, was not an “official” sponsor of the primary election, but the company is expected to provide volunteers again in November. Mark Walker, EnergySolutions spokesman, says volunteering was the individual decision of employees, rather than a corporate decision. “It boils down to: We’ve got a lot of employees that enjoy being involved in the political process,” he says. EnergySolutions, the company, does enjoy being involved. In the election for Salt Lake City mayor, for example, the company donated to the two candidates who won the primary election. Ralph Becker received $2,000. Dave Buhler received $1,000. An EnergySolutions lobbyist donated money to losing candidate Jenny Wilson. Swensen says the clerk’s office would make sure company representatives don’t work the polls during elections in which their company had an interest. Manpower took the county up on an option to turn Partners in Democracy into a corporate charity drive. The company gave its employee volunteers the day off with pay, then bundled the county poll-worker-stipend money together to donate to charity. “We saw this as an opportunity all Americans should be taking seriously: their right to vote.” Smith said. Sponsors that participated in September’s primary are scheduled to be back again for November’s general election. New sponsors are scheduled to be added, including EDO Corporation, a U.S. Navy contractor; the St. Joseph Villa nursing home; and Black Diamond, an outdoor-equipment maker that has in the past lobbied the state for protection of open space and, in the recent Salt Lake City mayor’s primary, donated to the Becker and Wilson campaigns. The general election might additionally feature Nemeth. He isn’t sure exactly what to do with his anger but is toying with the idea of showing up at the polls with T-shirts.